Eleven Rivington is pleased to present a solo exhibition by Icelandic artist Katrín Sigurdardóttir, on view from October 5 - November 4, 2012. This presentation marks the artist’s second exhibition with the gallery. 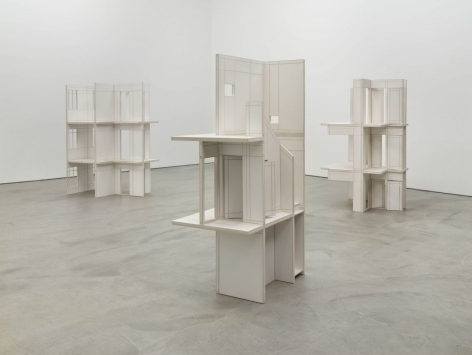 Representative for Iceland at the upcoming 2013 Venice Biennale, the artist recently concluded a significant and large-scale installation, titled Boiseries, at The Metropolitan Museum, NY. Sigurdardóttir’s predominantly sculptural practice focuses on the adapted representation, modification and containment of time, space and place - a practice whose greater intention is to eschew a conventional approach by the viewer. 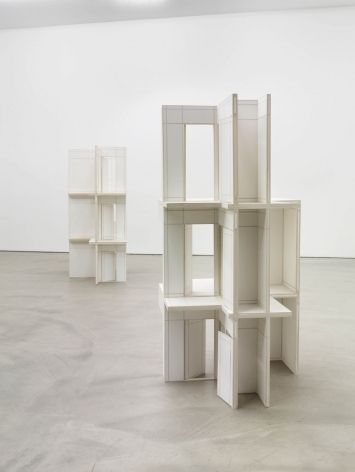 With architecture and landscape as sources, the artist’s sculptures use scale and distortion to focus attention on the space and perception between the viewer and the object. Using the vernaculars of architecture and topography, Sigurdardóttir creates objects with a prismatic spirit that fractures a viewer’s perspective. 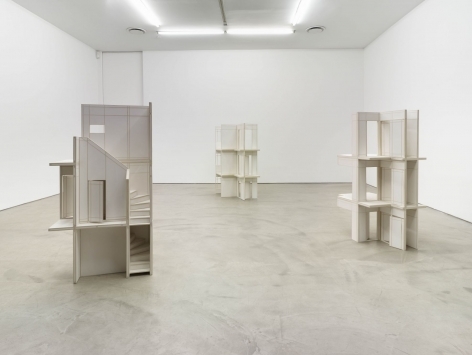 Titled Ellefu - Eleven in Icelandic - Sigurdardóttir’s show will include three intimately scaled hydrocal and basswood constructions portraying interior segments of her childhood home in Reykjavik, located at Langahlíð 11. With photographs and memory as departure, the artist systematically cross-sections the rooms and chambers to reveal not only fragments but vessels of times past. Low to the floor, the three constructions appear like axonometric drawings from eye level but the porous, handmade material approach belies the vector-like simplicity of the sculptural forms. The ambiguously Lilliputian rooms, stairwells and hallways, intentionally abstracted and emptied of all detail, encourage movement in the round, allowing the viewer to furnish the spaces with his or her own recollections while remaining tempered by the fragility and sense of redress inherent to the materials. Katrín Sigurdardóttir lives and works between Reykjavik and NY. She has exhibited widely in galleries and museums in the past 15 years, including notable solo shows at The Metropolitan Museum of Art, New York, MoMA PS1, New York; Galerie Meesen de Clerq, Brussels; Galleria Maze, Turin; Gallery i8, Reykjavik; Galeria Leme, Sao Paulo; FRAC Bourgogne, Dijon, Sala Siqueiros, Mexico City, Fondazione Sandretto, Turin and Reykjavík Museum of Art. Her awards and residencies include Ateliers des Arques, The Louis Comfort Tiffany Biennial Award, The Rema Hort Mann Foundation Grant, and residencies with LMCC Lower Manhattan Cultural Council and Art OMI International Artists Colony.